Located in Paris, Maillot Studio offers self-catering accommodation with free WiFi. The apartment is 400 metres from Palais des Congrès de Paris. 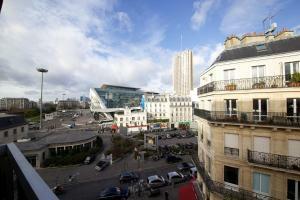 The Arc de Triomphe is 700 metres from Maillot Studio, while the Eiffel Tower is 2.3 km from the property. Paris - Orly Airport is 17 km away. Rate: € 132.25; select dates below to get current rates.